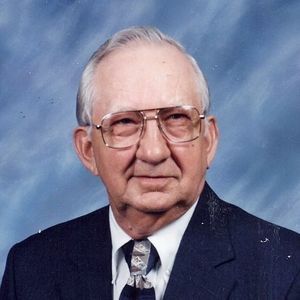 GREENVILLE - Lester Franklin Peterson, 81, of Greenville, died Wednesday, October 27, 2010 at Muhlenberg Community Hospital. Mr. Peterson was born on August 18, 1929 in Muhlenberg County. He was an oil field worker, farmer, and was a retired coal miner with the Arch of the Green Coal Co. He was a member of the Sharon General Baptist Church, where he served as a deacon, trustee, and Sunday School teacher. He was preceded in death by his parents, J.F. and Lena Phillips Peterson, sisters Elizabeth Peterson and Rosa Coombs, and brothers Ernest Peterson and Adrian Peterson. Survivors include his wife, Hazel Peterson; son Rev. Ricky (Beverly) Peterson; daughters Regenia (Donnie) Lovell and Ronda Hearld; grandchildren Jerrod (Tracy) Hearld, Jennifer (John) Finley, Stacy (Harold) Wester, Bailey Peterson, and Sarah Peterson; and great-grandchildren Isaac Springer and Eli Finley. Funeral services will be Saturday, October 30, 2010 at 2:00PM at Tucker Funeral Home in Central City, with Rev. Darren Pentecost and Rev. Darrell McIntosh officiating. Burial will be in Green's Chapel Cemetery in Greenville. Visitation will be Friday after 5:00PM at the funeral home. Online condolences may be made at www.tuckerfuneralhomes.com. We are so sorry about the loss of your father. We weren't aware of his death until yesterday. We are always here for you and your family if you need anything at all. You are in our thoughts and prayers. I have many fond memories of Uncle Lester, but my favorite is listening to him tell stories about growing up. i loved to hear he and my dad talk about breaking mules, horses, and one steer to ride, and pull a plow. They could talk for hours about cattle and horses. Another cherished memory is the times we all spent together showing horses and trail riding. He was always willing to load up Regenia"s and Ronda's ponies (Buttermilk and Strawberry) and haul them to Pembroke for a week each summer. The sound of his laughter is another favorite memory ("Hee, Hee, Hee). He never met a stranger, and delighted in his family, friends, and fellow church members.